Ruthiebear (Titusville, NJ, United States) on 5 January 2017 in Lifestyle & Culture. For the next couple of days I am experimenting with my photo taking. this is really cool - like a well-executed painting ! More of a drawing Ruthie, but I have to say that I quite like this. The white structures with the green background is nice. Good luck with your experiment. Like a water colour and Ink lines too!! Very creative!! Success to your experiment!! A very creative experiment. i like the teepees and how you placed them in the image. Intelligent post processing! That has created some water colour effect! Strange but cool. I like it. I love your experiments Ruthie.... you have such a unique way of doing things. Looking at it closer I feel it could be a painting.... it's very appealing, I like the visual!! This is fun, pure and simple ! How do you do that Ruthie ? Very creative processing used here!! Looks like a beautiful painting. Like a painting, well done Ruthie. They look like tee pee's (don't know the spelling). It is an odd cartoon effect that kind of suits the image. 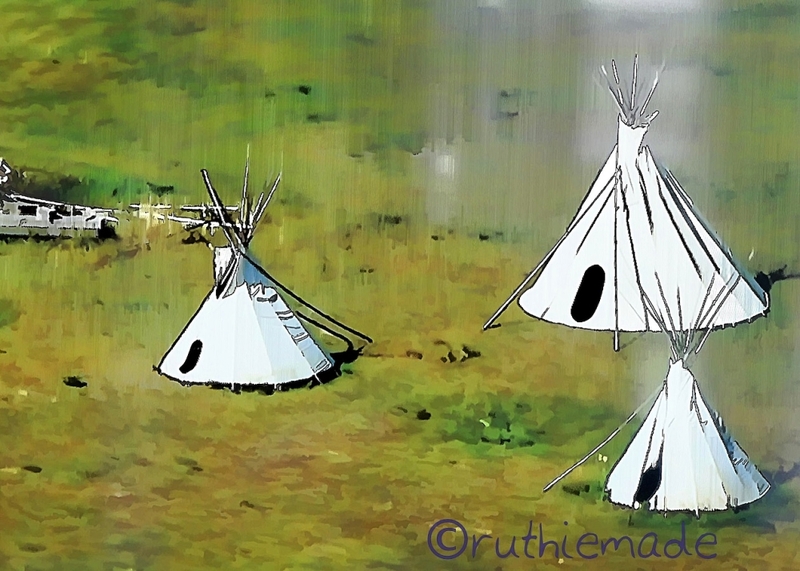 I like the cartoon effect and the white brush strokes behind the teepees.